As of 2018 I have partnered with Abandoned Pet Rescue, Broward county's largest no-kill shelter, to bring aid to cats and dogs in need. Together, we can help 100's of animals live a healthy life until they find their forever home. Any student that arrives at class with $5 or more in cat or dog food will get a $5 cash back credit at time of class. Just show me a physical receipt of your purchase. The receipt is yours to keep as a tax write-off. Of course, cash donations are always welcome, in lieu of or in addition to a food donation. This 3 hour hands-on workshop will give you the keys to unlocking the "exposure triangle" – aperture, shutter speed and ISO – the basic elements for every photograph. This is the perfect place to finally let go of the "Auto" setting on your camera and start enjoying the artistic, eye-capturing pictures composed by the professionals. Taught in an art gallery and outdoors, in this engaging environment there are only 10 students per class, ensuring ample personal guidance and practice time. You will see some of the instructor's professional portfolio and then immediately grasp the techniques used as it is explained in a simple and straightforward manner. You will go home with course materials, your own example photos in your own camera and a whole new understanding of your camera's dials, buttons and settings. As an added bonus, you will hear a simple 5 minute lesson that will instantly improve at least 60% of your pictures. You already take good photos; this class will make them better. Classes are held to a maximum of 10 students. Additional class times are added based on demand. Please contact me directly for private group lessons via phone, 954.675.8085, or email, tj@howdoiusemydslrcamera.com. Class dates and times are found at my online store. Simply select the class date that works best for you and proceed through the checkout process. Groupon.com voucher holders will follow the same purchase process which should also be outlined on your voucher. Registration is required prior to arrival. It is best to register your spot online at my store. Class dates listed online are the most up to date and reflect real time availability. For question or problems with registration contact T.J. via phone, 954.675.8085, or email, tj@howdoiusemydslrcamera.com, with the date and time you'd like to attend and I'll get back to you with a confirmation or alternate date. Please be comfortable with reviewing pictures on your camera. This includes the ability to zoom in and scroll when reviewing images. See your instruction manual and/or bring it with you to class. Park in the green spots indicated on the map below. Just in front of the gallery are about 4 or 5 spots. More spots are located along N. Flagler Drive in the grassy swale. 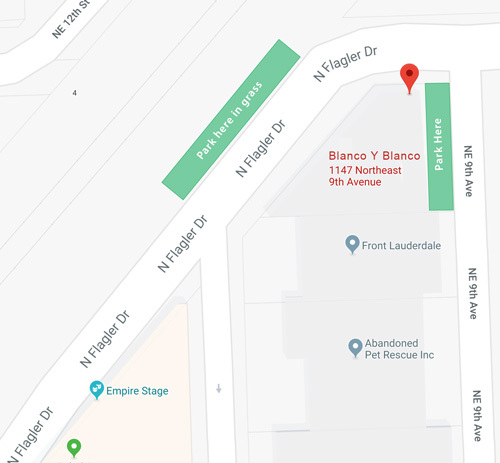 DO NOT park at any business other than Blanco Y Blanco or the parking lot of any apartments as your vehicle will likely be ticketed and/or towed. Please park in the green areas. Using your GPS/Maps app will be the easiest. 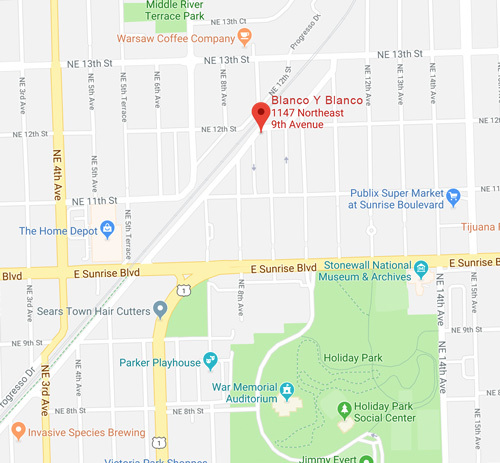 However the most direct route is to take NE 12th Street west from NE 15th Avenue. NE 12th Street is just north of Sunrise Blvd when on NE 15th Ave.
Due to high demand classes typically run full. Cancellations require a minimum 72-hour notice and will incur a $15 rescheduling fee. All cancellations made by the student 72 or more hours before the scheduled instruction time will will not incur a penalty. No-shows will forfeit fees paid or the full value of the voucher. To cancel please call me at 954.675.8085. Be sure to leave a voicemail if I do not answer so that I may properly process your cancellation. All cancellations made by the instructor, regardless of when or why, will not penalize the amount paid by the student/client. This class was great and TJ the instructor was awesome! He explained all the "technicalities" I normally have a hard time understanding, in a way that I could easily understand and put to use in my future as a photographer. I highly recommend TJ!! He is really, really good!! I've been a trainer and a teacher for much of my life and you did great. TJ is awesome! He is really good about teaching you about THE CAMERA and maybe telling you his idea about artistic composition but he truly understands that if it looks good to you, it must be great :) I have had my DSLR for a few years and I never used it b/c it didn't do what I wanted. I took my camera out the next day and am pretty excited to keep using it b/c now it is doing what I want it to! would highly recommend to anyone who doesn't know their camera well or who uses the program mode--you just spend hundreds of dollars on a camera so learn how to use it. Thank you very much for the class. We both came away learning so much more than we had expected in a two hour course! I only wish I had done this sooner...I can't believe I have had my DSLR camera set on auto for 5 years! So excited to practice some of the things we learned, and look forward to taking more classes to build on what you taught us. Great personality, really knew his stuff, a fun experience. Very knowledgeable. Loved the hands on experience. Made such technical info simple which pleased me & I tended to learn more. I thought the class was very informative. TJ is really knowledgeable and explains thing very clearly. The practice exercises were perfect.